For years, doctors have associated the BRCA1 and BRCA2 gene mutations with an increased risk of breast cancer. But researchers at Texas A&M University have now identified another gene that may have an impact on breast cancer—associated with the body's circadian rhythm. Texas A&M College of Veterinary Medicine & Biomedical Sciences (CVM) professor Weston Porter and his team have found that Period 2 (Per2), a regulatory mechanism within each cell's peripheral clock, plays a crucial function in mammalian mammary gland development and that when suppressed, Per2 leads to severely disrupted gland development in mice. The findings, published in the scientific journal Development, add to a growing list that ties disruptions to our circadian rhythm—that is, the "central clock" mechanism in our brains—to a higher risk of cancer progression, obesity, some neuromuscular diseases, and other impairments, including jetlag. Circadian rhythm is controlled by the suprachiasmatic nucleus (SCN) in the brain's anterior hypothalamus. In addition to coordinating our sleep patterns, the SCN coordinates the other peripheral clocks in our body, which run on a 24-hour cycle that corresponds with each day. "Not only do we have a central clock, but every one of our cells has one of these peripheral clocks and they're in coordination with the central clock," Porter said. "When you wake up in the morning and see light, the light goes right into the brain and it triggers this molecular mechanism that regulates the (circadian rhythm) process." In their study, Porter's team evaluated Per2, which provides the "negative feedback," or counterbalance, to the circadian rhythm process. "The negative and positive feedback mechanisms are constantly in balance, going up and down. One's up during the day, the other one's up at night—they oscillate right at 24 hours—but when you see light, that resets it in the morning," Porter said. "When Per2 comes back, it suppresses another gene called BMAL or CLOCK." Their finding—that Per2 has a crucial function outside of timekeeping in mammalian mammary gland development where Per2 plays a role in cell differentiation and identity—describes a potentially important role for Per2 in breast cancer. Per2 expression is lost in a large percentage of mammary tumors, which suggests it may have protective effects. "We discovered that these glands have what we call a kind of a bipotent phenotype; they're actually halfway to cancer," Porter said. "They've already have many of the characteristics you would see in a premalignant cell. "We started to look at the mechanism associated with that and found that the stem cell markers associated with a loss of Per2 are more basal, which is characteristic of more invasive cancer," he said. "This reinforces the idea that Per2 is functioning as a tumor suppressor gene associated with cell identity." 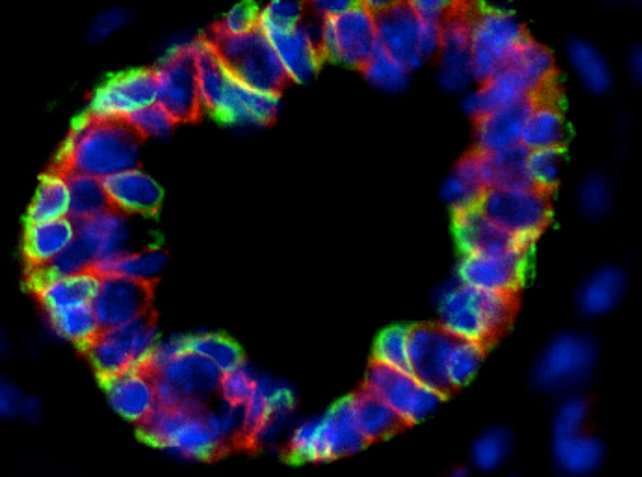 In addition to disruption of the developing mammary gland, Porter also saw the same defect in transplant studies, showing that it is Per2, and not just the central clock itself, that is responsible for the lack of mammary ductal growth in the developing gland. Their next step is to revisit studies that correlate working a night shift with an increased risk of breast cancer. "Right now, we are investigating how our findings relate to humans," Porter said. "There are studies out there showing a relationship between decreased levels of Per2 and certain types of breast cancer, which are more invasive. So, we believe that there is a direct relationship." Understanding circadian rhythm and its effects on the body have become increasingly important to the science community. The 2017 Nobel Prize for Physiology or Medicine was awarded to researchers for discoveries of the molecular mechanisms controlling the circadian rhythm, and the National Cancer Institute recently named the role of circadian rhythms in cancer as one of their 12 provocative questions for the year. You believe that that clock is causative? I believe it is a manifestation of something else going awry, something never discussed.